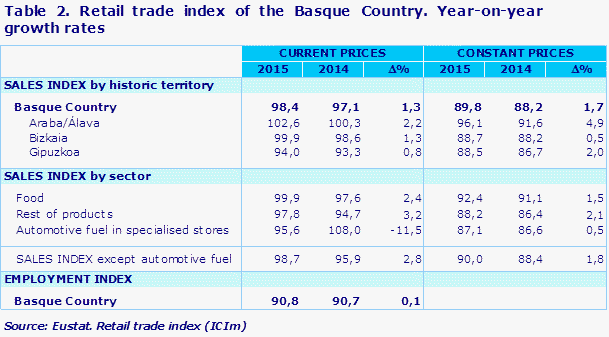 The retail trade sector of the Basque Country registered a 1.2% rise in nominal sales in the fourth quarter of 2015 with regards to the same period of the previous year, according to data provided by Eustat. Sales in the sector, not including service stations, were up by 2.9% in year-on-year terms. With respect to the previous quarter, the sales index was down a nominal 0.1%, once any seasonal effects had been eliminated. By sector, food products registered an increase of 3.6% in nominal sales in the fourth quarter of 2015, retail trade of other products saw a rise of 2.4% and sales of automotive fuel dropped by 15.2%, all with regards to the same period in 2014. In the retail food sector, specialised trade was up by 1.1%, as non-specialised trade in mainly food products rose by 5.0%. In retail trade of other products, there was a rise in trade specialising in personal equipment (4.3%) and in trade specialising in household equipment (3.9%). In trade specialising in other consumer goods there was no appreciable change (0.0%), and there was a fall in non-specialised trade in mainly other products, which was down by 2.2%. By Province, Álava registered a decrease of 0.5%, whereas in Bizkaia and Gipuzkoa there were increases of 2.1% and 0.6% respectively, compared to the same quarter of the previous year. For their part, retail trade sales, not including service stations, posted a real upturn at constant prices of 1.5% with respect to the same quarter of the previous year. Compared to the third quarter, in the fourth quarter of 2015 there was a drop of 0.5% in real sales, once seasonal effects had been eliminated. Within retail food trade, sales rose in constant terms by 2.1% compared with the same quarter in 2014, and retail trade in other products increased by 1.0%, with retail sales of automotive fuel decreasing by 2.1%. Within retail food trade the year-on-year evolution for specialised food trade was negative, with a fall of 1.4%, with non-specialised retail trade in food posting an upturn of 7.2%. In the trade of non-food products, there was a decrease in non-specialised trade of mainly other products, which fell by 2.3%. Trade specialising in personal equipment did not experience any variation in its sales with respect to the 4th quarter of 2014 in real terms (0.0%), whilst trade specialising in household equipment rose by 4.7%, and trade specialising in other consumer goods rose by 0.7%. The three Provinces registered increases in their sales in real terms: Álava rose by 1.6%, Gipuzkoa was up by 1.3% and Bizkaia increased by 0.8%, with respect to the same quarter of the previous year. 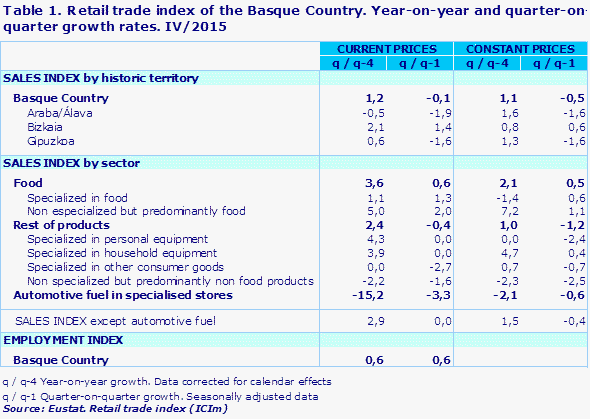 The number of people employed in the retail trade sector in the Basque Country overall in the fourth quarter of 2015 was up by 0.6% on the third quarter. There was an accumulated nominal increase of 1.3% in retail trade sales for the year overall. If service stations are excluded, other retail trade sales rose by 2.8%, in the accumulated data of 2015 with regards to 2014. In real terms, there was an increase of 1.7% in the sector as a whole, and without including service stations the increase was 1.8%. By province, the best results in nominal rates were registered in Álava, with an increase of 2.2% in the year overall, followed by Bizkaia, where there was a rise of 1.3%, and then Gipuzkoa, where the increase was 0.8%. In constant prices, Álava rose by 4.9%, Gipuzkoa by 2.0% and Bizkaia by 0.5%. The rise in employment in the retail trade sector in 2015 compared to the average of the previous year was 0.1% in the Basque Country. Methodological note: trading companies previously not included have been incorporated into this sample frame, and some indexes have been recalculated. This has improved the representation in certain elementary series. Several series have therefore been reassessed at activity type level, as have their corresponding aggregations.